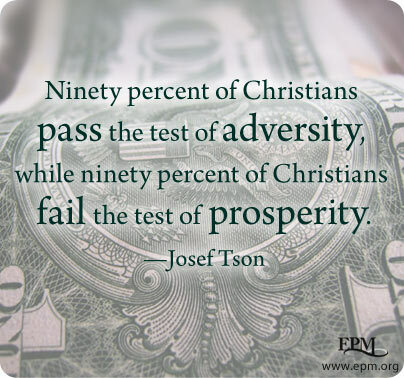 Dwight L. Moody once said, “We can stand affliction better than we can prosperity. For in prosperity, we forget God.” In the following video and transcript, I share some related thoughts. We need to realize that if not for the work of God in our lives, we would have never experienced these abundant blessings. How many good things come our way that we didn’t work for or earn or achieve, but were just given into our laps through the homes we grew up in and the culture we live in? These blessings come through the things that God has done in the past and is doing in the present for us. At the moment we meet Christ—at our death or his return—all accounts will be frozen, all assets and expenditures opened for the Final Audit. Jesus says, “It is more blessed to give than to receive” (Acts 20:35). As long as I still have something, I believe I own it. But when I give it away, I relinquish the control, power, and prestige that come with wealth. At the moment of release, the light turns on. The magic spell is broken. My mind clears, and I recognize God as owner, myself as servant, and other people as intended beneficiaries of what God has entrusted to me. When the following was posted last month on the Desiring God blog, written by Michael Oh, I was very touched by it. Read it, ponder it, pray over it. As thunder follows lightning, giving follows grace. They’re inseparable. If God’s grace touches you, you can’t help but respond with generous giving.